Lucky pigs and dancing lions: Gōng xǐ fā cái! This year, Chinese New Year is celebrated on 5 February 2019. Also known as the Spring Festival it is based on a lunar calendar (13 months, based on the phases of the moon), it can fall anywhere between 21 January and 20 February – depending on the phase of the moon. In fact, Chinese New Year is not just one day, but covers a period of over two weeks. While the Western world has its 12 zodiac signs, the Chinese have 12 animals which rotate over a 12 year cycle. These are the rat, ox, tiger, rabbit, dragon, snake, horse, goat, monkey, rooster, dog and pig. 2019 is the Year of the Pig (in Chinese: 豬), the twelfth sign of the Chinese zodiac. 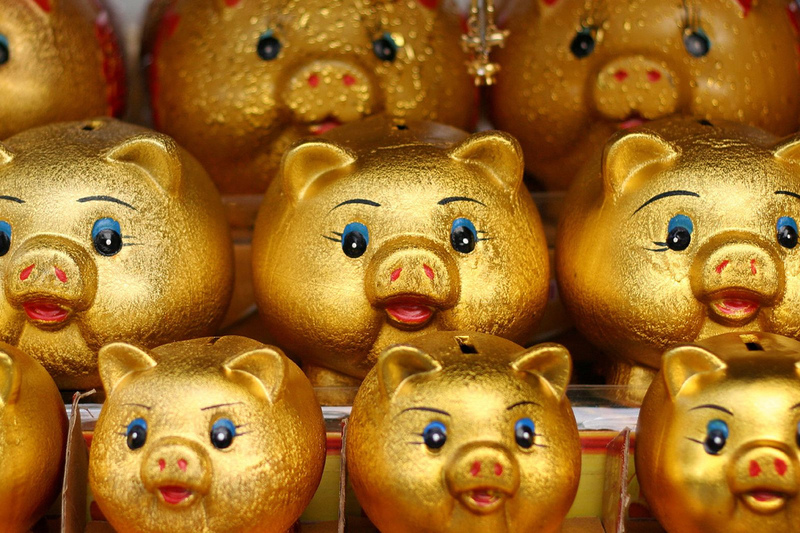 It is believed that children born during this year will be blessed with a sunny personality and good fortune – the pig representing luck, good fortune and prosperity. Culturally, pigs are considered lucky creatures at birth. They are always well fed and cared for. Pigs are also a symbol of virility, often displayed as a golden lucky charm in the bedrooms of couples trying to conceive. Traditionally this is a time to pray to the gods and ancestors, to visit family and eat traditional foods such as tang yuan (rice dumplings), nian gao (rice cakes) or fa gao (fortune cakes). Chinese New Year’s Eve is considered to be the most festive day of the period, where families traditionally reunite for a feast. Celebrations begin with firecrackers (to scare away bad luck), followed by the flurry of colour of the lion dance parade, and the festival of lanterns. The colour red symbolises luck, joy and happiness and is prominent among the costumes and street decorations. New clothes at New Year also signify good luck. Red envelopes containing money are often given to children – a symbol of the passing of wealth in the family from adults to children. So if there’s a ‘Chinatown’ near you, why not join in the celebrations and taste some of the must-have delicacies… Gōng xǐ fā cái! Etymax is a leading London-based translation company and specialised language service provider to companies in global industries. When localising content for international markets, understanding the symbolism behind your brand and message is vital to your global success. Etymax offers translation and localisation services with an in-depth knowledge of local cultural concepts. In every language.